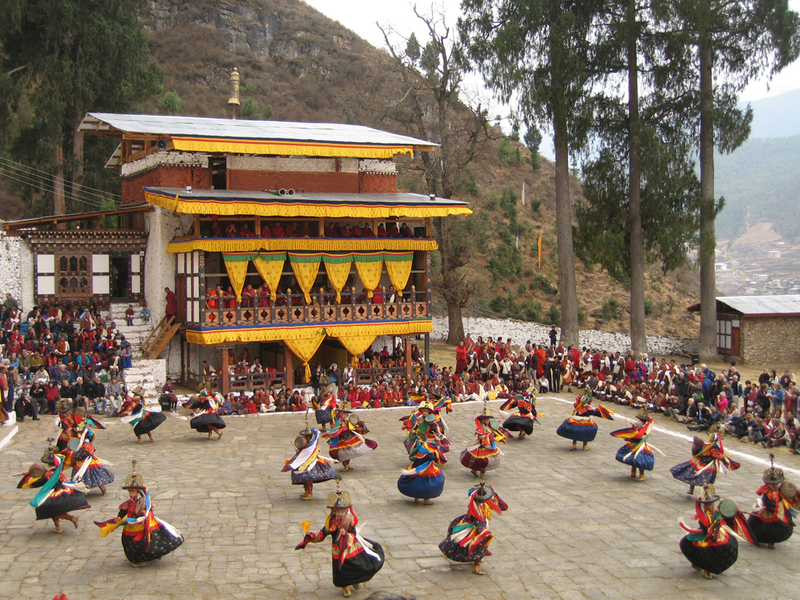 … all 779 of them taken on Wild Frontiers‘ Bhutan: Land of the Thunder Dragon – Spring Festival Tour in March 2008. 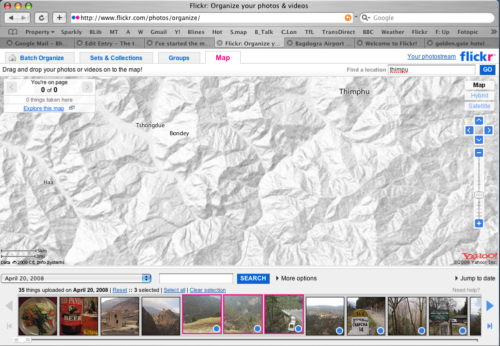 You’ll find them in my Bhutan – Land of the Thunder Dragon set on Flickr. Uh oh, here we go again…. Land of the Thunder Dragon Spring Festival Tour: booked! Having spent last Saturday and yesterday shrinking and rotating my only-just-less-than 1000 photos taken on the Land of the Thunder Dragon trip, I’m now starting to work my way through them, adding highlights to my Land of the Thunder Dragon set on Flickr. 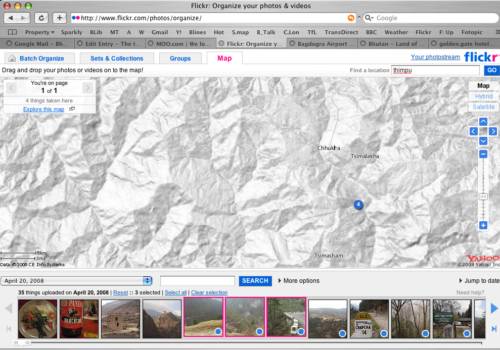 What you see so far is days 1, 2 and 3….. most of which were spent getting to Bhutan. Day 4 we spent at the Paro festival where I took a bazillion photos of whirling dancers and Bhutanese dressed in their best togs …. and day 5 featured the fantastic Tiger’s Nest monastery trek and is almost as bad in terms of the number of photos I took. Maybe it wasn’t such a good idea for Phil to buy me another 2GB memory card in anticipation of my Central Asia trip this autumn …. Tired, but a great trip – although I wouldn’t rate it as highly as the Hindu Kush Adventure or Iran trips – Bhutan doesn’t quite have the same edge. Plus there was a lot of driving in India at the end, and the Tolly Gunge Club didn’t really provide the ‘high note’ finale. It felt altogether too worldly and self important after a fortnight up in the mountains and high pastures. Days 4 and 5 were the highlights for me, featuring the Paro festival and the hike up to the Tiger’s Nest. We were there during the country’s first democratic elections, which was fascinating, and I returned with a commemorative calendar, prepared in advance of the Fifth King’s coronation (due to happen this year – no one knows when!) and lots of woven baskets. Oh, and a taste for cheese and chilli dishes, plus a developing daily G+T habit…..! Returning home to BJH via the ‘new’ St Pancras International has added somewhat to the out of body experience resulting from our 90 minute nap prior to driving across Kolkata to check in (early) for our 4.45am flight, which kept ahead of the dawn all the way back west to London Heathrow. I was a bit of disgruntled ‘customer’ even before we got to the airport. Still, the glamour of St Pancras and a mezze lunch Au Pain Quotidien with Phil, Paul and Jahraj sorted me out! Work tomorrow. I’m taking my Kings of Bhutan commemorative calendar in for moral support. … my track record of unwittingly foreshadowing unrest and/or international incidents on my travels seems to be continuing unblemished…… and I thought Bhutan was meant to be a peaceful place!